It is rare to find utility sinks that are both practical and attractive, but here at HC Supplies you can make your selection from a fabulous range of beautiful utility room sinks. Our hardwearing utility room sinks are available in an assortment of styles and materials, and all currently feature in our amazing utility sinks UK sale. With an assortment of sizes from which to choose, you will discover the perfect kitchen and utility sinks, no matter how small or large the space. Take a closer look at our cut price utiity sinks today. All our products are offered at discounted prices, with many considerably sold at less than the recommended retail price. We feature stunning freestanding utility sinks and utiity sinks for laundry rooms from high end designers including Smeg, Schock, Astracast, and many more world-renowned utility sink designers. choose from single, double, 1.5 and 0.5 utility sinks for laundry rooms and make the household chores more pleasant with the presence of a beautiful piece of craftmanship. Whether you require stainless steel utility sinks, or prefer the idea of a ceramic model, we have the sink for you! Cheap Utility Sinks In All Shapes and Sizes! HC Supplies aims to cater for all, so if you are looking for large utility sinks, or need a great selection of small utility sinks to choose from, we have the utility sinks to suit your exact requirements. We only stock quality goods, so you can be assured of outstanding utility room sinks that will be a welcome addition to your home, lasting for many years to come. Choose from round, rectangular, and square sinks, each with its own contemporary style. Browse the entire collection of utility sinks from HC Supplies, and grab a bargain today. As experienced retailers, we know how to ensure the safe and swift delivery of utility sinks to anywhere in the UK and beyond. To arrange delivery of your new utility sinks to a UK address within 2 to 7 working days, simply contact our team. Should you require delivery to anywhere in Europe or further afield we can make this happen too. Furnish your property abroad at a discounted price when you purchase your utillity room sinks from HC Supplies. If you need assistance deciding which kitchen and utility sinks would best suit your individual needs, our friendly customer services team will be delighted to help. Fill in your details on the online contact form, and one of our advisers will be in touch as soon as possible. Should you prefer, you can also call us to discuss your needs. Homeowners living within a 30 mile radius of our showrooms can also talk, with advantage of our fantastic kitchen design services fully-trained experts on hand to offer style advise at extremely competitive prices. 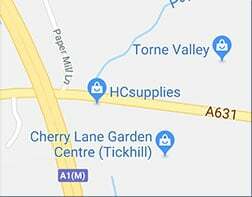 If it's convenient, why not call in to our showroom in Doncaster for a closer look at our kitchen and utility room products? Our customer services personnel are available to help in any way they can, and customers can avail of nearby car-parking during their visit.